← How Intentional Are Your Holiday Thoughts, Feelings and Habits? Leadership starts with authentic self-expression that adds value through relationships. This is one of my leadership core values. It helps me be more discerning about my relationships and my role in those relationships. Among other applications, I have taught it to my boys since they were young. Countless times I have reminded them (I’m guessing they would say a nauseating number of times) to be authentic and positive in their thoughts, words and actions, and to look for the same in others. Never a neutral influence? Is this true? Does it matter if neutral influences exist or not if they serve no purpose? “Neutral influence” is an oxymoron, isn’t it? There are four distinct quadrants on my Influence Matrix below. Each quadrant represents a broad distinction of how expression and Influence affects Relationship. I am not so naive to assert that relationships are this distinctive, but it is helpful to think of your leadership influence being this distinctive. Every relationship can move from quadrant to quadrant at any time; there are no “bright lines” of distinction separating the direction or amount of influence in a relationship. (I wish there were such clear distinctions; relationships in general would be so much more simple!) 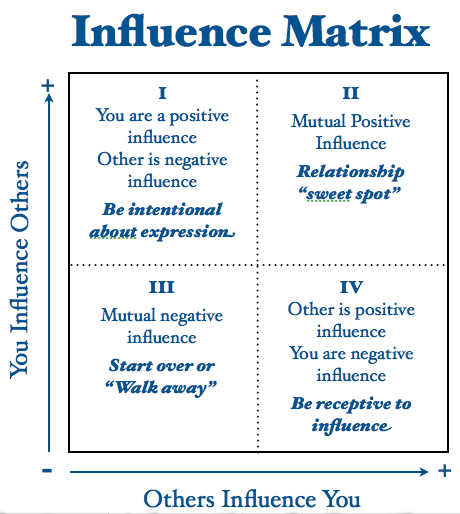 In fact, that’s why this is an Influence matrix and not a Relationship matrix. The influence of a relationship may endure beyond the life of the relationship itself. Obviously, a leader adds value in Quadrants I and II. That does not make Quadrant IV bad. Quadrant IV is paramount to growth; it is the quadrant of mentors, role models and coaching. Quadrant IV can be a positive growth area for any leader. The more receptive you are about Quadrant IV relationships, the more likely you are to grow as a leader. Further, if you do NOT feel that you have any relationships that require some work in Quadrant IV, you are likely not growing as a leader as you could. Quadrant III relationships are problematic but should not be ignored. You have a choice to follow, to walk away, to stay the same (destructive) course, or to “reset” your assumptions and attitudes. The latter choice creates the potential to drive new behaviors on your part that, hopefully, will produce positive results for both of you. That is the work of a leader. Be authentic in your expressions of leadership, which include all that you say and do. To be your most effective self, be intentional about your positive influence on others and receptive to their positive influence on you. Through your relationships you are either adding value in your marriage and family, at work, and in your community – or you are not. There is no neutral ground. This entry was posted in authentic, communications, influence, Influence Matrix, leadership, measure of a leader, relationships. Bookmark the permalink.